The next issue of the Carnival of Mathematics, rounding up blog posts from the month of December, and compiled by the team, is now online at Ganit Charcha. The next issue of the Carnival of Mathematics, rounding up blog posts from the month of November, and compiled by TD, is now online at Chalkdust Magazine. The next issue of the Carnival of Mathematics, rounding up blog posts from the month of September, and compiled by Alexander, is now online at Codima. 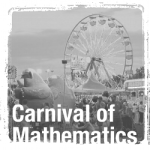 The next issue of the Carnival of Mathematics, rounding up blog posts from the month of August, and compiled by Mel, is now online at Just Maths.